Even though we're still a little under a couple months until The Avengers: Age of Ultron hits theaters, it's probably safe to say our heroes will defeat the title villain before the end of the film (though we wonder if we'll lose some team members in the process). 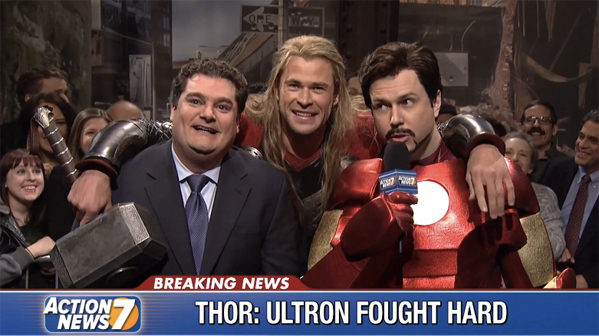 However, the folks at "Saturday Night Live" are ahead of the curve by predicting flawless victory for our heroes in a new sketch from this past weekend's new episode with Thor himself, Chris Hemsworth, as the host. And with the battle over, the God of Thunder is ready to party like a frat boy as he's interviewed live on the news, and he even seems a bit drunk already. Watch! Jeremy Renner appeared as Hawkeye on "Saturday Night Live" a couple years ago right here. I think what Chris is doing is called "acting." I think you can get jobs doing this, but my parents keep telling me to be a doctor. I think I liked Renner's Avengers skit more. Chris was endearing though. Hopefully given his ending of Serenity, Joss will realise that someone will need to be sacrificed to give the final standoff some form of tension. I guess the problem is that considering they like to pretend kill off characters (Fury in Cap 2 for example), it won't really generate a feeling of peril because everyone will be expecting whichever character it is to make a miraculous comeback.